Does the patient have a chronic health condition? Does the patient have any kind of allergies? Is the patient on any medication(s)? What are they? Has the patient had any recent surgeries? 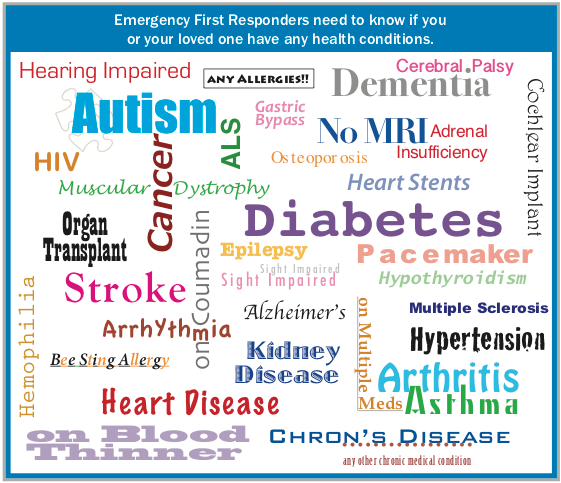 Emergency First Responders have questions and the MediPal Seatbelt ID has answers. The MediPal Seatbelt ID is a simple and comprehensive medical ID that wraps around your seatbelt and slides to any comfortable position. By virtue of its location on your seatbelt, the MediPal ID can better capture the attention emergency first responders at the scene of a traffic accident and thus offer immediate access to your health condition, emergency contacts, etc. Inside each MediPal ID is a tri-fold health profile form that has been filled out by the user, (or guardian). There is ample room for noting allergies, medications, recent surgeries, blood type, etc. The user can fill this information out by hand, or download a PDF version which can be filled out using a computer. The user can save their Health Profile form to their computer and can return anytime to update their information. (MediPal Inc. never has access to the user’s information.) The Health Profile form is printed and inserted it into the MediPal ID holder and is ready to be placed around the seatbelt with Velcro® attachment. There is also a designated spot for placing a small photo of the user to reduce the chances of confusion when/if there are multiple passengers. If you are considering buying a high-tech medical ID requiring a first responder to scan a QR code, (or another symbol), you may want to consider if you will always have reliable internet connectivity while out on the road. The MediPal Seatbelt ID remains as simple as possible and requires no internet connectivity or passcodes. **Information provided through personal interviews with numerous Firefighters and Emergency First Responders throughout the U.S. The MediPal ID can be utilized in many ways. Along with the Velcro® attachment there is also an elastic arm band to offer versatility while you are on-the-go. We do recommend that our customers keep one MediPal Seatbelt ID on their seatbelt simply to avoid the possibility of the MediPal ID being removed and the user forgetting to return it to its intended location, on their seatbelt. Every day in the U.S. 6,693 vehicle occupants are injured in traffic accidents. Defensive driving skills save lives by preventing accidents. 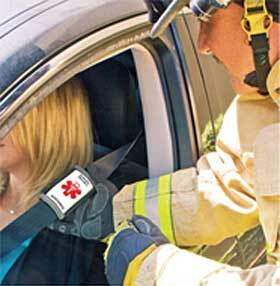 The MediPal Seatbelt ID helps EMTs save lives in the event of an accident. Visit our FAQ page to learn even more! Copyright © 2019 MediPal Inc. All rights reserved.